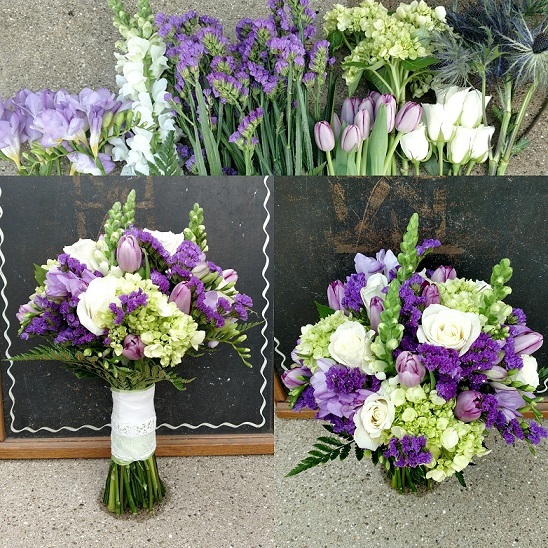 I had the pleasure of doing a bouquet and boutonniere for our friends Genevieve and Will on their big day. You might recall that Genevieve baked our wedding cake, hand pies, and brought serving dishes for our wedding dinner, and helped us out with some of the catering service as well. So naturally it was a gimmee that I wanted to gift them wedding flowers! She told me she wanted purple with some white and green and that gave me free range to style up something lovely. I went to a local market the day before and picked out all the flowers, came home, prepped them and started building the arrangements. Drop off the next morning, and it was fun to see all together at the reception. The lovely bride told me she had so many compliments on them which was fantastic! Here’s what I did! 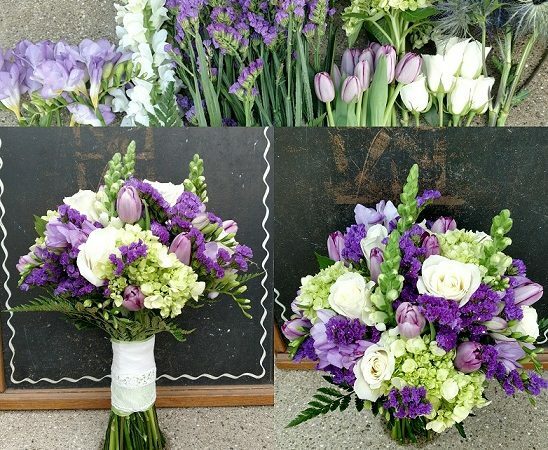 Flowers: dark purple statice, purple freesia, white roses, white snapdragons, lavender tulips, mini hydrangeas, leather leaf fern. I wrapped the stems of the bouquet in green ribbon and then a sweet vintage hankie. 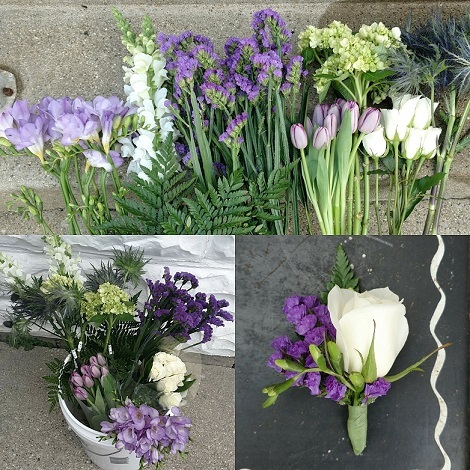 3 shades of purple along with the white, dark green, and the limey green of the mini hydrangeas really made the monochromatic purples work! I just love how it turned out and was so happy to be working with flowers again! Color of the Month June 2017! Color of the Month June 2017! We picked up a large lot of Fire King Azurite dishes at a flea market over Memorial day. The cool unique color inspired this month’s vignette and table setting. And in today’s heat a cool blue feels just right! 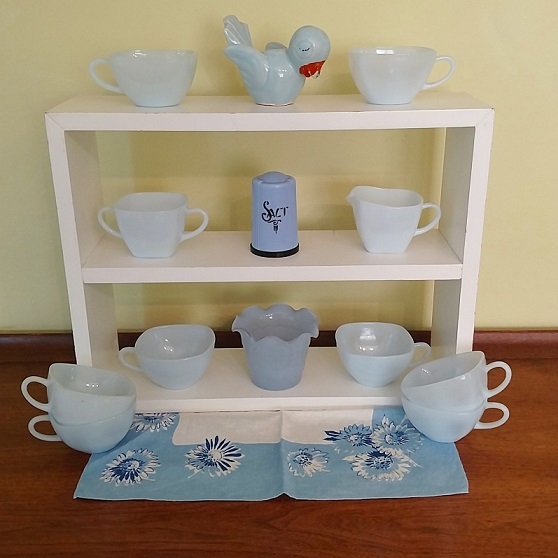 Fave vintage: the dishes of course, birdie planter, deco salt shaker, ruffled planter, and charming vintage napkin. 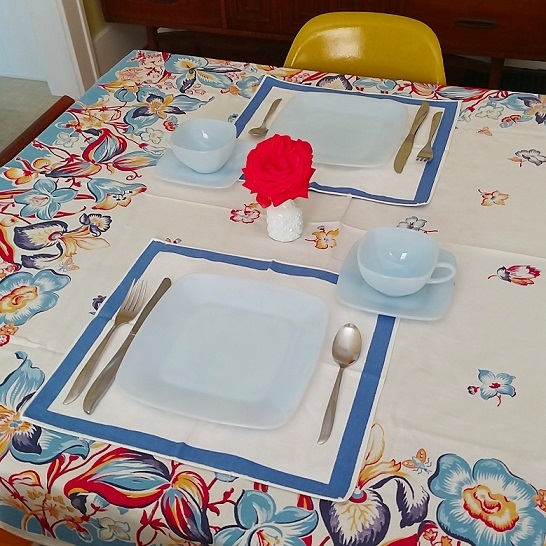 Pretty simple but packs a nice punch with the tablecloth! 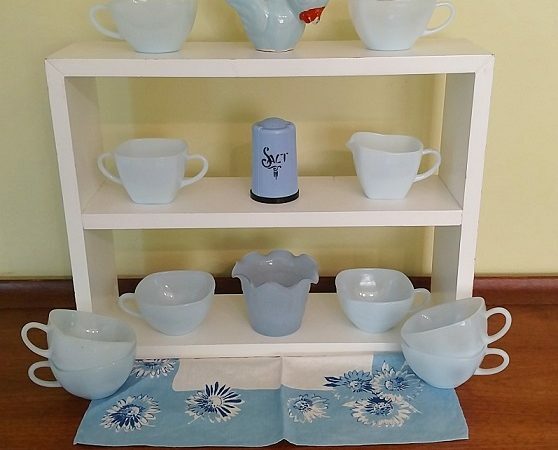 Fave vintage: Fire King azurite dishes, blue edged napkins, awesome tablecloth, and little milk glass vase with a snip of my America rose.